It may be the little sister to the Belgian Beer Fest, but the September 10-12 German Beer Festival at Maxs Taphouse in Baltimore, Maryland, is still full of good beer. Maybe it's the lagers, or maybe it's the less than astronomical rates of IBUs and ABVs (with exceptions! ), but this informal festival seems to bring out less geeky rambunctiousness and more Gemütlichkeit. General Manager/Beer Manager Casey Hard says that his list is 80% completed. In addition, at current count, he has 20 bottled German beers, and more than 10 German gravity kegs. He continues to work on securing more draughts. Beers will be served in mugs, Maßkrugs (one-liter steins, pronounced "mahss"), one liter boots, and some 2-liter boots (modeled below by long-time bartender Jamie). I noticed a Washington, D.C., area beer bar recently mentioning that they would be serving German firkins at an event they would hold. The term 'firkin' explicitly refers to a 9 UK gallon cask, or, as measured in US terms, 10.8 gallons. The Germans don't measure in gallons; they use the metric system. 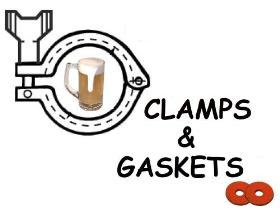 A common size for a German keg is 50 liters, which roughly corresponds to 13.2 US gallons. More to the point, a firkin is a cask, a vessel in which a secondary or tertiary re-fermentation occurs. Though one might encounter kellerbier —lager re-fermented in a keg, or served unfiltered from a tank, such as zwickelbier— a German brewer would bemused to hear her kegs referred to with a British term. Here's a picture of a Reisssdorf Kölsch keg, which has a spring-loaded bung, on its side near the bottom, through which a bartender can insert a tap. Since extraneous CO2 is not used to push the beer through the lines, serving it by gravity tap will result in a less gassy mouthfeel —similar to beer from a cask. And, yes, the beer is unpasteurized —as are many kegged beers, by the way— but it is not a cask! It is filtered, kegged beer, that can also be dispensed via a 'standard' draught system through a top spear and coupler. Take none of this as disparagement. Fresh, well-made, full-flavored lagers (and ales, such as Kölsch) can be sublime. According to the Symphony IRI Group, sales of 'craft' beer were up 11.9% in the first half of 2010. As comparison, sales of the beers of the top 10 'mainstream' brewing conglomerates decreased by more than 5 million cases. For example, Anheuser-Busch Inbev sales were down 1.9%, SABMiller/Coors down 2.4%. Here's the really big news. In recent years, 'craft' beer sales have comprised about 5% of the total US beer market. During the first half of 2010, they dramatically surpassed that level, reaching 8.7%. Of the top 'craft' breweries, New Belgium grew the most, up 28% in sales dollars. Sierra Nevada Brewing's Torpedo an IPA named for a special piece of hopping equipment— grew 200% versus 2009, best among the top 15 'craft' beers. Ray Daniels tweeted the results as they were announced. Beer Advocate aggregated those tweets. Jay Brooks summarized them. Stan Hieronymous compared the results to those from 2006. Preliminary figures released in early August showed that 'craft' breweries had sold approximately 4.6 million barrels (31 gallons = 13.78 cases) for the first six months of this year, versus 4.2 million in the same period last year. That's 9.1% growth, which, although robust, doesn't quite match the 11.9% number above. Does that discrepancy indicate lower growth —or loss— for sales of draught 'craft' beer? I don't know (even though anecdotally I wouldn't believe so.) 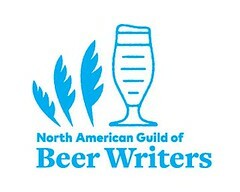 I look forward to the Brewers Association publishing a more thorough recap and analysis. The couple pictured above, smoking, was NOT among those arrested. It remains legal to smoke OUTSIDE of a Virginia restaurant. Restaurant Tuscarora Mill was well ahead of the curve when it opened in Leesburg, Virginia, in the early 1990s. Draught 'craft' beer was more difficult to come by than it is now, but Tuskies (as locals affectionately refer to it) was offering good draught beer in both a casual cafe setting and a more formal room with 'white-tablecloth' service. In the 2000s, proprietors Kevin and Shawn Malone (the latter, pictured above, carrying a firkin), opened a second restaurant, Magnolias, even more beer-centric, also in a converted mill, but further west, in Purcellville, Virginia. In 2007, they opened a third, much smaller location, in the same historic mill building in Leesburg as Tuskies. Called Fire Works, the intimate pizzeria featured a domed wood-burning oven for making Neapolitan-style pizzas, and a fascinating array of import and 'craft' draughts. It would prove to be a harbinger of the direction the brothers would take. A second Fire Works American Pizzeria & Bar opens tonight in the Court House district of Arlington, Virginia. To call it a 'second' location, hides Fire Works' extent. Seating over 200, inside and out, it features 30 draught beer lines, 2 dedicated cask-conditioned ale lines, (yes, a wine list), and, again, a domed wood-burning pizza oven. The glassed-in refrigerated keg room is situated just inside the front door. The kegs and maze of lines and gauges are clearly visible though large windows. Large metal pipes carry the draught lines overhead to the bar. Fire Works also has an extensive bottled beer list, and will offer 2-liter resealable bottles of draught-beer-to-go, called growlers. According to Fire Works' Facebook page, the public grand opening is scheduled for 5pm tonight. The address is 2350 Clarendon Boulevard, Arlington, Virginia, at the intersection of Clarendon Boulevard with Adams Street. The phone number is 703-527-8700. The cask ale lines may not be operational tonight, but beer manager Jesse Prevatte promises soon! See a slideshow of construction and pre-opening: here. Caveat lector: As a representative of Select Wines, Inc. —a northern Virginia wholesaler— I sell wine and beer to Fire Works. Heavy monsoon rains have caused massive flooding in Pakistan, killing many people and challenging relief efforts in remote areas stranded by washed out roads and bridges. Reports estimate that nearly 14 million people have been affected by the disaster - more than the combined total of the 2004 Indian Ocean tsunami, the 2005 Kashmir earthquake and the 2010 Haiti earthquake, according to the United Nations. Critical supplies, especially clean water, are in demand. Donations are needed to help provide emergency relief to those currently in desperate need. Network for Good has an extensive list of charities and NGOs now providing care and relief and reconstruction in Pakistan. Fresh vegetables from a co-worker's garden, in the car, on the drive home (yes, with a stick shift). The 2nd annual DC Beer Week takes place August 20th through the 28th in Washington, D.C.
As an organizer of the event I really feel your pain as far as including local breweries. It gets logistical. What is considered too far to be included? Is Star Hill a local brewery? Do we extend out to Frederick? What about the bars and restaurants in those areas that then want to participate in DC Beer Week? With Stars and Bars, Chocolate City, and DC Brau, it is going to get more interesting next year. It is something that we debated and since we are still in our toddler stage of growing the events and participants we can't open that can of worms... yet. Next year we want a home brewing competition, and also try and incorporate those "local" breweries to do events with the various establishments in DC. I love the suggestions and want to grow this into the best it can be. 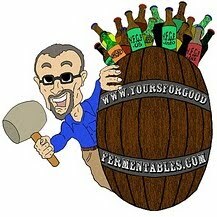 Thanks for all your interest and input, we need the beer community to help guide us. Teddy Folkman is chef at Granville Moore's in the Atlas District of Washington, D.C. Among his many accomplishments, Folkman bested 'celebrity-chef' Bobby Flay in a televised mussels-cooking competition. In the photo, Chef Folkman is sitting in the foreground, with beer distributor 'Hoppy' Jeff Wells, fellow co-founder of DC Beer Week. As opposed to the following week's DC Beer Week, this foodie celebration extends festivities past the city's boundaries into the greater metropolitan area. According to the official website, participating restaurants will be offering three-course fixed-price lunch menus for $20.10 and three-course fixed-price dinner menus for $35.10. Beverages, gratuity and tax will not included. Some of the restaurants really get into the swing of things and offer almost their entire menus as part of the deal —a big deal, indeed. As the official website doesn't list this information, a better resource would be from Linda Shapiro at the Washington DC Examiner.com. She's compiled (and updates and reviews) the menus for all of the participating venues. VeggieDag is an occasional Thursday post on vegetarian issues. On hiatus today, it returns next week. Why the name? Here. Washington D.C.'s 2nd annual DC Beer Week —a 9 day "celebration of beer culture in the nation's capitol [sic]"— will take place the 20th through 28th of August, at venues throughout the city. Including craft beers and music pairings and featuring: Beer Director Greg Engert of ChurchKey, Founder & Brewer Brian Strumke of Stillwater Artisanal Ales, Tracy Jill Doty from the NIH, Cobra Collective, New Rock Church of Fire and many more. Craft Beer Cruise on the Cherry Blossom 6pm-9pm featuring over 20 different breweries, appetizers, and a whole lot more. $70/person. To purchase tickets go to www.capitolloungedc.com/beercruise. Space is limited to 150 people. Elliot in the Morning presents DC Beer Week in studio. Elliot will be promoting the nights marquee events along with some of your favorite beer geeks and craft beer venues in studio. Room 11 along with Victory Brewing present two beers rarely seen outside the Victory Brewpub, Mad King Weiss and Gassy Jack Bitter. Join us as we pour an insanely limited OAK CASK of Heavy Seas Loose Cannon (that's right the cask itself is made of OAK!). We will be featuring a regular cask of Bourbon Barrel-Aged Heavy Seas Hang Ten and Vintage Below Decks Barleywine as well! Granville Moore's joins Susan Greene of Global Brewers Guild for an entertaining night of Belgian and Belgian style American Beers and a 5 course dinner carefully pairing and integrating the beers with the food. $70/person Call 202-399-2546 for reservations. Space is limited to 35 people. Trusty's Burgers Beer and Bus – Have you ever dreamed of drinking craft canned beers while sitting in your old elementary school bus. Well now is your chance with the launch of the Bus Bar upstairs. Kick back with Butternut beer and figure out which lunch box you used to (or still) have. H Street Country Club Butternut Pints for Putts – The shot of your life. 1 Beer. 1 Putt. 120 feet. Sink it and walk away with a regulation totally sick Pool Table! Justins's Cafe presents Racing Dangerously. Racer 5 IPA and five different flavors of pie from Dangerously Delicious Pies on H Street N.E. Beer and pie? Yes. Gimme a slice. Star and Shamrock Tavern with He'brew Ales “Brisket & Brews” - Join Shmaltz Brewing Company and the Irish/Jewish cuisine of the Star and Shamrock along with tasty He'Brew ales for some creative pairings. 18th Amendment Pizza Night with the 21st Amendment Brewing Company. Pizzas will be hot and beer will be cold along with reps from 21st Amendment there to keep it all together. Troegs takeover at The Red and The Black. Glassware giveaway, Mad Elf in the Summer, Troegs Band, guaranteed fun. District Chop House - Meet The Brewer, Barrett Lauer, and enjoy tours of the brewery along with half price beers at one of the Nation's Capital's finest Brew Pubs. District Pour House and Coney Island Lagers take you from NY to Boston. Jeremy from Shmaltz Brewing Company will be there talking and throwing beer around while the kitchen is batting up some lobster rolls. Breadsoda presents Beer vs Beer – celebrating “Braugust” Beer Month at Breadsoda. Think about it, what is better then a huge deli sandwich and cool craft beer? Letting the guys at Breadsoda pair them for you. Meridian Pint and Schlafly Brewing Company present Dan Kopman Co-Founder and Brew Master of St. Louis Brewing. Special rare tastings of Schlafly beers paired with unique offerings from the Meridian Pints wonderful kitchen. Big Hunt Michigan Blowout Night featuring specials on Founders, Bells, and New Holland. Get your Wolverine Gold and Blue or Spartan Green on. RFD – You know they are closing it out with a PARTY. For more information, visit the website at dcbeerweek.net, or Faceboook, or follow on Twitter at @DCBeerWeek. It's 'DC' Beer Week, I'll hear in response, not 'near to DC' Beer Week. Alright, then. So what do Bells or Rogue or St. Louis Brewing have to do with Washington, D.C. other than their tasty beers are sold in the city? I've said it before, and, risking opprobrium, I'll continue to say it: until the greater Washington D.C. area embraces, nourishes, and cherishes its local beer heritage, it will not have a true beer culture, such as do Philadelphia, Asheville, or Baltimore. Yes, let's celebrate the great diversity of beer choices available city-wide, a recent and wonderful development, but why can't or why won't we show local beer pride in Washington, D.C.? It's all the rage to support local food and farmers, to be 'locavore'. But with craft beer, it seems that, at least in D.C., a beer must come from from somewhere else to be appreciated here. As of Friday 8/13, the website for the event has gone 'live' at dcbeerweek.net. UPDATE: Chef Teddy Folkman, a co-founder of the event, has responded to my post. Caveat lector: As a representative of Select Wines, Inc., a distributor in northern Virginia of wine and beer, I do sell a 'local' beer: Heavy Seas of Baltimore, Maryland. Alex Hall has done a lot for the condition of cask-conditioned real ale in America. Now, he has done more, creating a mashup of his Cask Beer Finder Database and Google Maps. It's an on-line map of "all known bars and restaurants in the United States that serve cask-conditioned craft beer" ... as those accounts alert Alex Hall that they do so! In addition to indicating which brewpubs, restaurants, and bars serve 'classic' cask-conditioned beers, Mr. Hall has also included those that serve tank-conditioned and keg-conditioned beers, "as long as these are 100% naturally carbonated, and extraneous gas is not used at any time in the dispense." This map is special enough that I've embedded it above. As Mr. Hall updates his map, it will be updated here. But, please: if you wish to learn more about cask-conditioned real ale, visit his site at cask-ale.co.uk/us/. The Great British Beer Festival is a celebration of beer held annually in August in London, England. The festival is organized by CAMRA —the Campaign for Real Ale— a consumer advocacy group for cask-conditioned ale and good beer in the United Kingdom. After a year of local tasting panels and regional heats leading up to the finals, CAMRA, the Campaign for Real Ale, is today proud to announce that Castle Rock (of Nottingham) brewery's Harvest Pale has been crowned the 'Best Beer' in Britain at the Great British Beer Festival, Earls Court, London. The Nottingham brewed real ale was judged the Supreme Champion over a host of other finalists in 7 different beer categories (Bitters, Best Bitters, Strong Bitters, Golden Ales, Milds, Winter Beers*, and the Speciality class), including beers from both small microbrewers and large regional brewers. The Award is named after the world renowned beer writer, Michael Jackson, also known as the Beer Hunter, and author of titles such as The World Guide To Beer, who sadly passed away in 2007. In dedication to his efforts to promote good beer, the competition is judged by a panel of Great British Beer Festival volunteers, and assessed on taste, aroma and finish. <...> With over 180 beers from the United States at the Great British Beer Festival this week, CAMRA is pleased to showcase the biggest selection of US cask real ale probably ever seen! CAMRA can happily report that demand for American craft beers at the Festival is extremely healthy, and invites people from across the world to its flagship Festival. Coming in 2nd was Loose Cannon Hop3 Ale, an IPA (7.3% alcohol-by-volume) brewed by Heavy Seas of Baltimore, Maryland. Congratulations to the brewery, its brewers, and to its cellarman, Steven Marsh. Proper respect is due of course to the winner. Smuttynose Brewing Company of Portsmouth, New Hampshire, took top honors with its Big A IPA (9.7% alcohol-by-volume). Smuttynose's success today means the New England brewery has now won this award three times, and remains one of the most successful brewers in the competition's history. From Steve Jones of Oliver Ales, more about other Maryland beers at the GBBF. Caveat lector: As an employee of Select Wines, Inc. —a northern Virginia beer & wine wholesaler— I sell the beers of Heavy Seas Brewing. Twitter FollowFriday. A Yankee in Earl's Court: Washington, D.C. beer guy @RickG_VA tweets at the Great British Beer Festival, Aug. 3-7.